Gigi McGuire, assistant director of community and academic partnerships, welcomed students and chaperones to CSUN. Photo by Lee Choo. 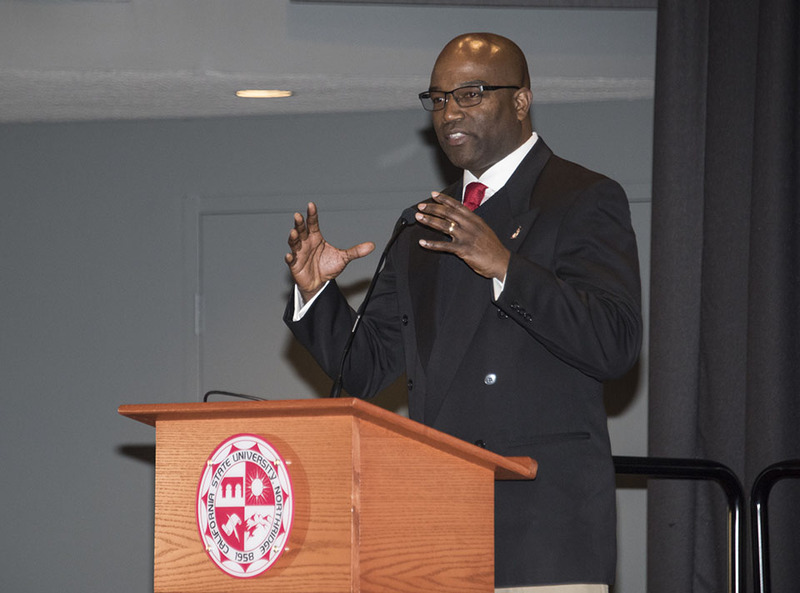 Associate Vice President for Student Access and Support Services Dwayne Cantrell spoke to hundreds during opening remarks emphasizing the need for students to find their voice and be inspired by what they learned. Photo by Lee Choo. 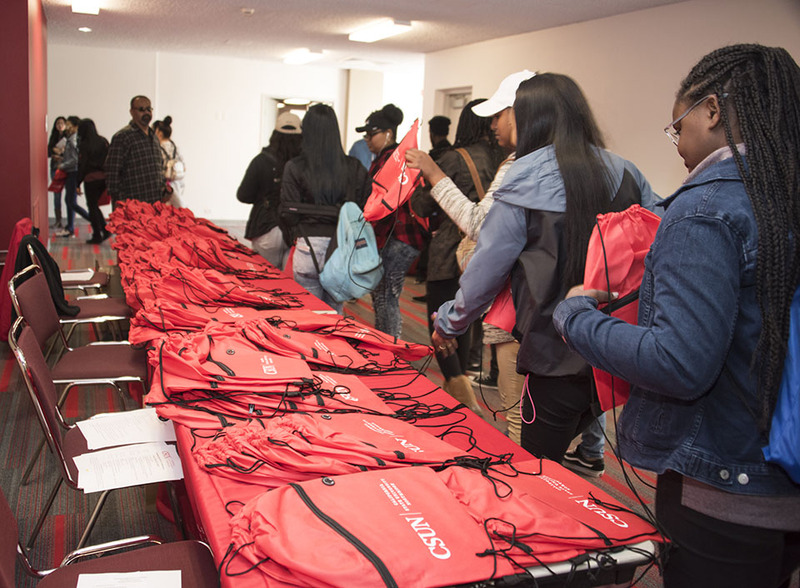 Upon entering the Northridge Center after campus tours, high school students and parents were able to pick up a CSUN bag to hold any paperwork they collected throughout the day. Photo by Lee Choo. 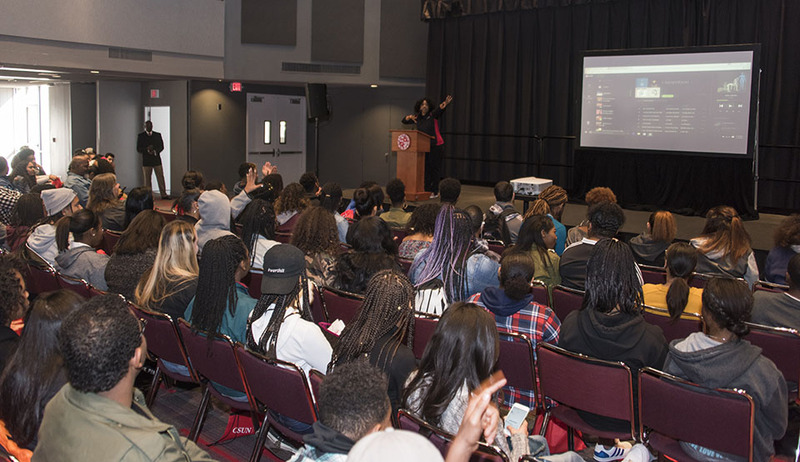 Hundreds of high school students visited California State University, Northridge for a day of learning and a college campus experience during the annual Harambee High School Conference. In celebration of Black History Month, the Department of Africana Studies hosts various events around campus throughout the month of February, including the Harambee conference — where CSUN’s Office of Student Outreach and Recruitment Services and the Harambee Student Association invite predominantly African-American students to speak with current CSUN students and faculty about their experiences in college. This year the conference’s theme was Africana Studies 360° — Black Synergy. The conference welcomed students from 20 high schools across Southern California to experience the daily life of a CSUN student. This year’s participating high schools included Birmingham Charter, Lancaster, Northridge Academy and Village Christian. At the opening session, Associate Vice President for Student Access and Support Services Dwayne Cantrell greeted students, chaperones and CSUN volunteers before sending students off for a host of scheduled workshops. After the introductory remarks, students were grouped together and invited to various rooms in the East Conference Center of CSUN’s University Student Union (USU). The sessions included a discussion about campus life with a panel of three CSUN students involved in the African-American community. The CSUN student panelists discussed reasons they decided to go to college, the challenges they faced once here and their paths to success. Student panelist Saacha Bracy, an Africana Studies major, spoke about her trouble with time management when transitioning to college life and how she found a sense of community among her classmates. The participating high school students took a lunch break before returning to the USU rooms for a series of lectures by CSUN faculty. Ninth-grade high school student A.J. Oden said this type of conference gives high school students insights into college life. “Your background could be similar to theirs [college students], and you can kind of see where you are heading,” Oden said. Oden said she liked that the conference gives students like her an opportunity to witness campus life firsthand — by seeing how things work at a university, and learning that there are different groups and communities for everyone on campus.